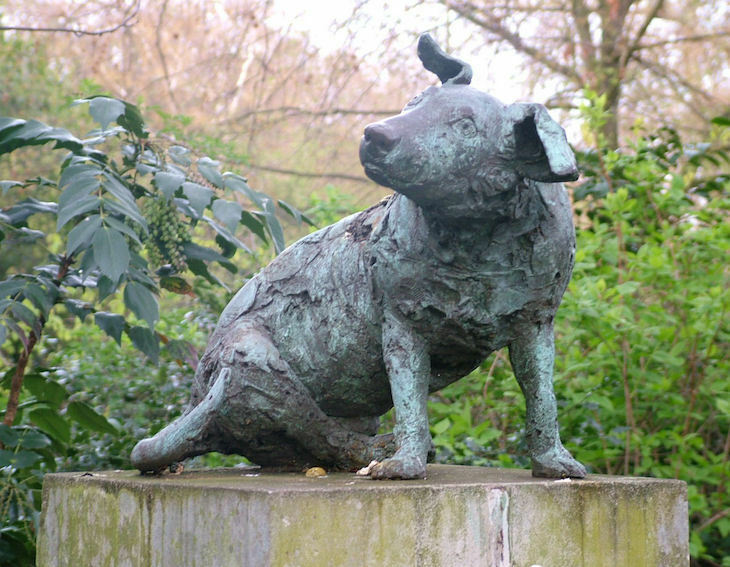 If you've been near the English Garden in Battersea Park, you may well have noticed the dog statue pictured above. The statue may seem harmless enough, but its predecessor was so provocative, it had to be removed under cover of darkness, protected by 120 police officers. We'll start at the beginning. 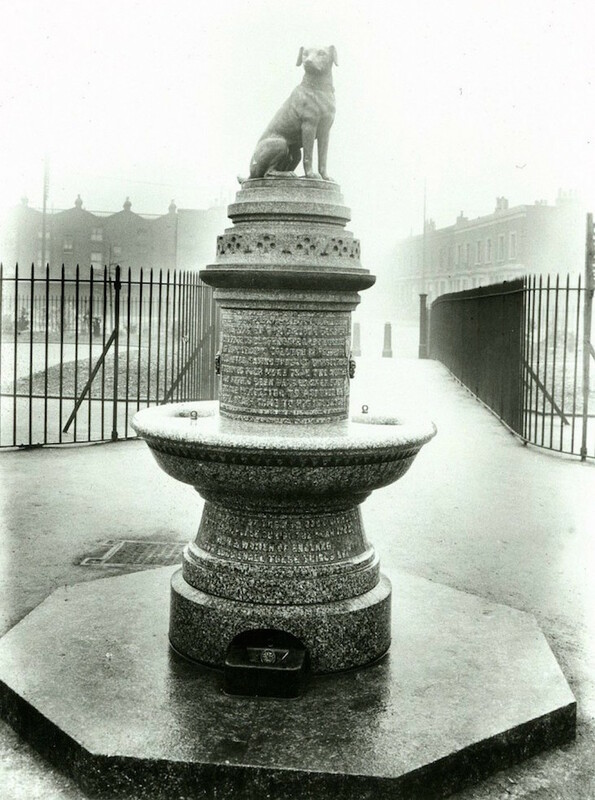 The original statue, a fountain with a drinking trough for dogs, and a dog on top, was erected on the newly built Latchmere Road Estate in Battersea in 1906. It was funded by anti-vivisectionists — people who fight against the use of animals in scientific research — in memory of a brown terrier dog who was used in experiments at University College in 1903. In memory of the brown terrier dog done to death in the laboratories of University College in February 1903, after having endured vivisection extending over more than two months and having been handed over from one vivisector to another till death came to his release. Also in memory of the 232 dogs vivisected at the same place during the year 1902. Men and women of England, how long shall these things be? In December 1907, the Manchester Courier described the words as "undoubtedly offensive", and they weren't the only ones. Medical students found the plaque provocative, resulting in it being vandalised several times and the police often being called out. Things came to a head on 10 December 1907, when the Brown Dog Riots took place. Around 1,000 medical students marched through central London to Trafalgar Square in a pro-vivisectionist protest. A further 100 marched to the statue in Battersea. In both locations, protesters clashed with police, and following the riots, protection of the statue was ramped up to a 24-hour police guard. one days' employment of 27 inspectors, 55 sergeants and 106 constables. The maths behind the claim is unclear, but there's no doubt that the cost of policing the statue was an issue of contention. In 1908, the Police Commissioner wrote to Battersea Borough Council to ask for a financial contribution to the protection of the statue. The council refused, and also denied that removing the statue was an option. This battle went on for the next two years. The statue was finally removed in 1910. Four council workers, reportedly accompanied by 120 police officers, were sent to remove it under the cover of darkness, in order to avoid further trouble. It's thought that it was melted down by a blacksmith in 1912. 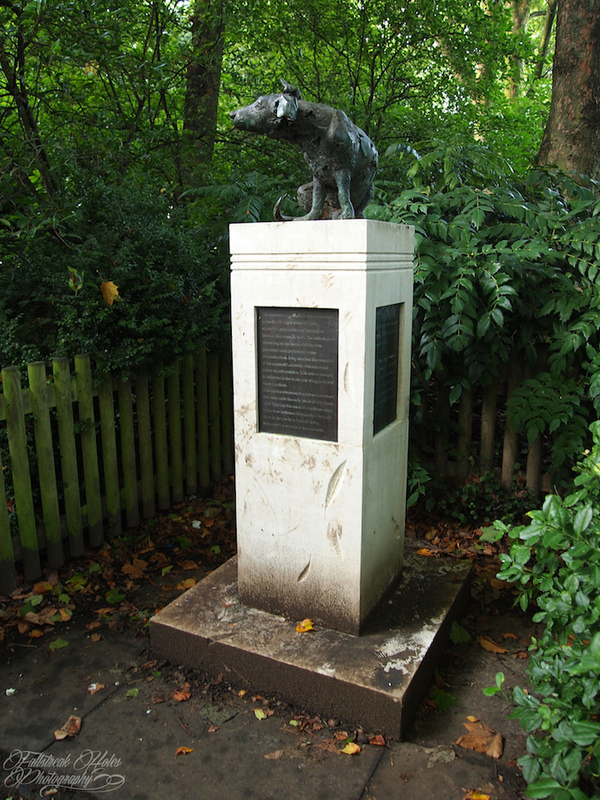 The new statue was unveiled in Battersea Park in 1985, and moved to its current site in 1992. It remains here today, having had a peaceful existence thus far.